Service to the public, to professional organizations, as well as to higher education is the keynote to Gary L. Trennepohl’s career. Born in Tulsa, he earned a B.S.B.A. in Economics from the University of Tulsa in 1968. After serving as a Captain in the U.S. Air Force, he earned his Ph.D. in Finance in 1976 from Texas Tech University and held faculty appointments at three successive universities, becoming the Executive Associate Dean of the Business School at Texas A&M University in 1994. 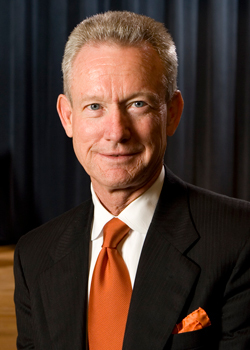 In 1995 OSU recruited him to be Dean of the College of Business Administration. Four years later he was appointed president of the fledgling institution, OSU-Tulsa. Serving in that capacity for a decade, he built the school up to a resident faculty of 75 professors and 3,100 students, and obtained through Herculean efforts $30 million for the Helmerich Research Center. In 2009, he returned to full-time faculty responsibilities at OSU, holding the ONEOK Chair in Finance and the President’s Council Endowed Chair. Besides his successes at administration, Professor Trennepohl has impeccable scholarly achievements. He has co-authored two textbooks, published over thirty articles in important scholarly journals, and has served as a manuscript reviewer for eight academic publications. In 1993 he was President of the Financial Management Association International. His expertise in the matters of investment management has been sought by numerous organizations; he is a member of the instructional faculty for the Chicago Board Options Exchange, lectures at the Cronkite School of Journalism at Arizona State University, and advises the OSU Foundation. He also chairs the Advisory Board for Oklahoma Blue Cross/Blue Shield and the Trustees Board of the Oklahoma Teachers Retirement System. He has served numerous charities in Tulsa and in 2009 the Tulsa American Red Cross Chapter named him Tulsa Man of the Year. The Society is proud to induct Gary L. Trennepohl in the Oklahoma Higher Education Hall of Fame.